Friday night’s attack on Damascus was chilling. No question. It dredged up the worst possible scenarios from our sub-conscious and for a few hours made them real. Now that the dust has settled, and we see what’s occurred (and what hasn’t) it’s time to draw some conclusions. First thing’s first. I reiterate what I said earlier in the week. Trump is finished. Read my article carefully, then overlay two things I didn’t talk about. One, Trump is impulsive and easily manipulated. Two, Trump is ultimately a coward and an appeaser, just like The Saker pegged him to be after bombing Al-Shairat last year. All bullies are cowards. That’s why they bully. Because of these personal defects, he gave his resignation speech last night. Be it later this year when he’s impeached/forced to resign for a war crime or in January 2021 after losing to a baked potato, the anti-interventionist crowd who elected him will remember this for a long time. I want to remind you of what happened last year with Al-Shairat. Trump bombed it while having dinner with Chinese Premier Xi Jinping. A light show of sound and fury which ultimately did very little damage. But, it did not signify nothing. It signified that Trump is out of his depth in foreign policy. A few months later Seymour Hersh, one of the few journalists left in the U.S., published his expose of what actually happened which led to the decision to bomb Syria. It was at this point I realized Trump wasn’t fit to conduct foreign policy. Trump wanted to go to war fully and was talked out of it by his military advisers, namely Gen. James Mattis. Mattis gave Trump the option he took. A big light show which the Russians allowed to occur so Trump could get some relief from his detractors and satisfy himself that he did something in response to what he perceived to be a morally reprehensible act. No 4-d chess. No back door coordination with the Russians. Just a man with a deep sense of morality that needed to feel powerful. Now fast forward to last night. Same story. Different circumstances since now Trump is even more isolated, more paranoid, more betrayed at every level by his political opposition. Do you think he hired John Bolton because he’s become more nuanced in his foreign policy approach? If you do, then you aren’t just an idiot. You are an heir to the throne of the kingdom of idiots. Sometimes when we do this type of analysis we forget about the men we are actually dealing with versus who we are personally. It’s easy to overlay our own abilities onto a public figure and think that if we can see this, he has to be able to. But, that’s the wrong approach. Trump is what he is. And re-reading Hersh’s account from last year reminded me of what we’re dealing with here. His refusal to act against his domestic enemies who are obviously guilty put him in the position he’s in now, having to trust the word of the worst people in U.S. policy-making, the John Bolton wing of the establishment. To survive last year, Trump made a deal with them. The military would be in charge of foreign policy. Trump would get to play president working on domestic issues. But, during that time things got even worse. Yes, he got some major domestic wins. He outlasted his opposition long enough to reveal the depths of their depravity and mendacity. But, all that time the center of the foreign policy establishment in Washington closed in on him. And the siren’s call of moralistic intervention to stop Iran and/or Russia was consistently impressed on him. So, here we are again. Trump’s enemies know how to get him triggered to do something stupid and against his good instincts. Then compound this by telling him the Russians are the problem. They are lying. They’ve betrayed him too. He has a near obsession with being the anti-Obama. It defines so many of his actions. It’s why he’s willing to tweet out a complete reversal of what he advocated for in 2013, for Obama not to bomb Syria. He was right then. But, as president, he’s defined Obama as his shadow, everything he’s not. And with good reason, Obama is likely behind much of the opposition he’s dealing with every day. These things build up over time. They paralyze a man as self-absorbed as Trump. He’s no angel, but he was the best option we had in 2016. Our options were Hillary Clinton or him. We chose Trump. But, make no mistake, we still elected DONALD TRUMP. And that leads me to where we are now. Yesterday I wrote that I thought Mattis and Trump were trying to run out the Neoconservatives clock on bombing Syria. I was half-right. Trump had already gone fully over to the neocons approach and Mattis talked him out of it. Bolton pushed for a broader attack hard and Mattis put the kibosh on it because he’s the adult in the room. If not, the Neocons would finally have the war they’ve been salivating for these past forty plus years. But, things have changed. The Syrians claim to have shot down 70% of the incoming missiles using old Russian anti-missile batteries, S-200’s, Buks, etc. Even if they are exaggerating and only shot down half of the missiles. It only makes the next steps clearer. Russia will sell Assad S-300’s now. Looking at the results of the attack last night I fully believe it was another ‘Goldilocks Option’ from Mattis like last year. While we may not have informed the Russians the attack was coming, France may have. Moreover, France may have backed out of actually firing missiles at all. If this was a serious attack on Damascus, which I don’t believe, then Syrians wouldn’t be dancing in the streets for having survived the U.S.’s impotent chest-thumping. They would be mourning their dead. We didn’t hit any Iranian, Russian or Hezbollah installations. The Israelis will be incensed. In fact, this was a no-winner outcome. Everyone was weakened by this to some degree in the short term, except the target of the attack itself, Bashar al-Assad. But, that’s where Mattis is smarter than Trump. He knows that even if one of Assad’s commanders went off the reservation and used chlorine gas here, something I give a 5 to 10% probability of, it’s not worth World War III over. He knows that horrible things happen in war. And that leaders and civilian populations cannot be held accountable for the deficits of one man or small cadre of men. There’s no real option for us to go deeper into Syria, despite what the Israeli lobby and the Neocons in the U.S. want. This attack didn’t help them. By doing this Mattis continues to let Trump blow off steam, make his points and hasten the day that we can actually get out of the Middle East. Meanwhile Trump just ensured that he has no bargaining power in North Korea, is aligned with the criminal U.K. government in illegally bombing a sovereign nation in violation of all international law and pushed Russia, Iran and China into a closer alliance. His opponents will hang him with this strike. Even if he was coerced into this against his will, it signals to the world he isn’t in control of anything and has no real power. So much for the Art of the Deal. Up until now, much of Trump’s successes have come from his allies supporting him by leaking damaging material domestically or covering for his mistakes internationally. They did this because they believed him to be sincere in wanting to devolve the U.S. empire and bring rationality back to international politics. And I still believe he is. But, with his unwillingness to evolve and become better they aren’t going to let him get his wins anymore. There’s no upside for Putin to let Trump take the credit for purging Syria of ISIS or brokering peace with North Korea anymore. Trump is hopeless on the international stage. Another false flag, another impotent light show. He’s not Orange Jesus, he’s a deeply flawed, if well-intentioned man. And it’s time we stopped the cult of personality and begin the hard work of Draining the Swamp. That’s why he’s done. And that’s why we’re not out of the woods yet. For now, we can let out a breath but this isn’t over. 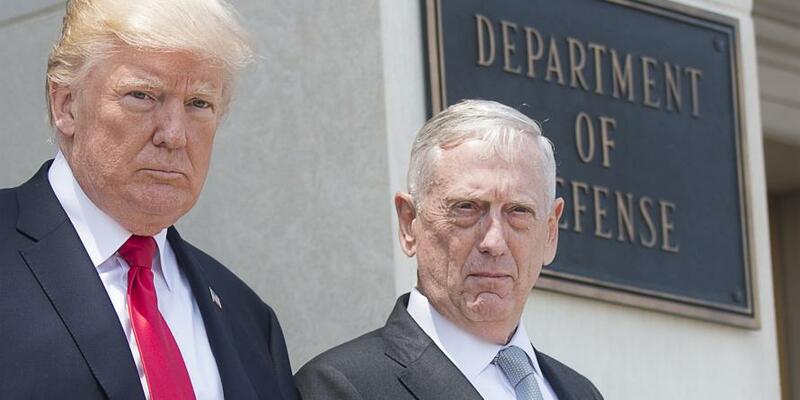 The neocons will push for Trump to fire Mattis next. If that happens, duck. To Support work like this and to see its continued presence in debunking the War of the Narratives, please pledge at my Patreon page and get access to both my Private Blog as well as the Gold Goats ‘n Guns Investment Newsletter.